Oh such a fun request! 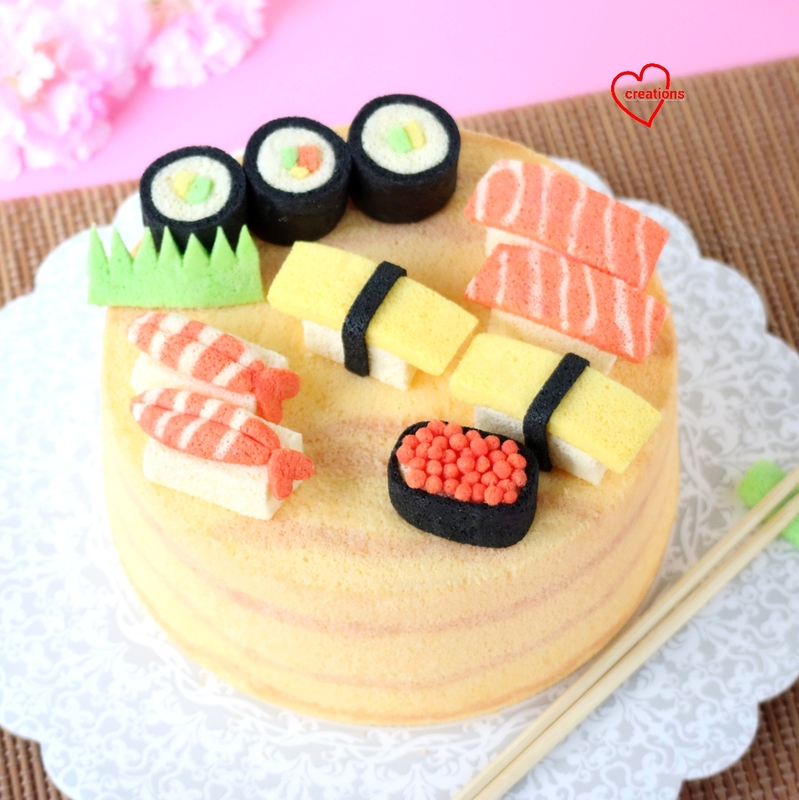 I was really happy to try making a Chiffon Cake Sushi Platter on a Wood-style Chiffon Cake!! As you know by now, I love new projects! She wanted it in the style of my previous Nyonya Kueh-themed Chiffon Cake that was well-loved =). 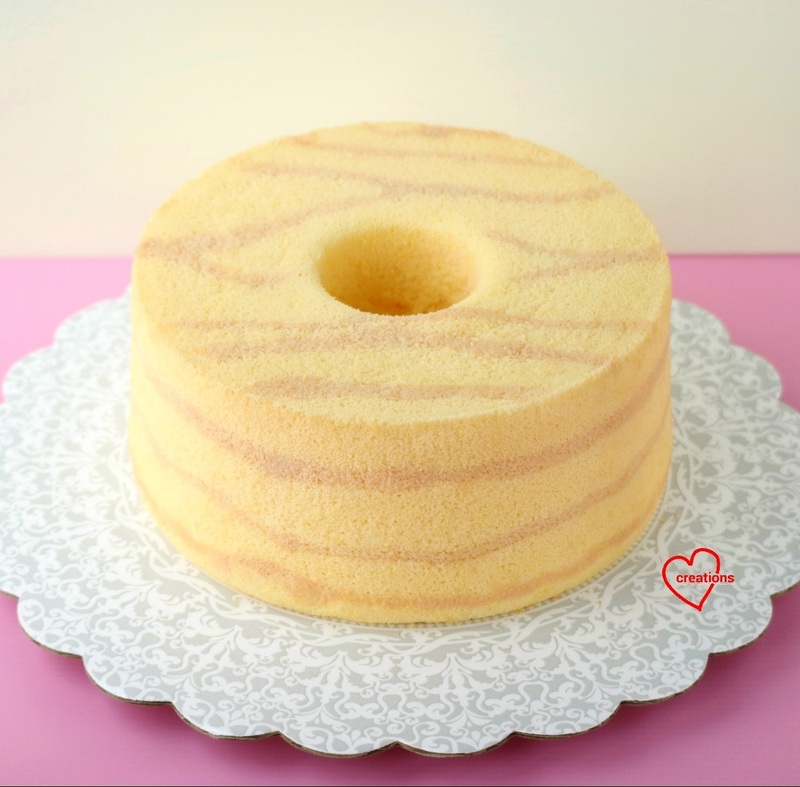 The Wood-style Chiffon Cake is made from Orange-Chocolate Chiffon Cake. The colour scheme of the flavour is just nice for making pine-colored wood. I patterned the brown batter into “wood grains” or wood-like pattern. As you know, I’m a very neat person, so I was quite nervous about making irregular wood grains. Thank God it panned out ok! 2. Beat eggs with sugar with whisk till pale and light before stirring in oil and juice. 3. Next add in sieved flour and whisk till no trace of flour lumps are found. 4. Spoon out 10 tsp and add ½ tsp cocoa powder, mix well. To the rest of the batter, whisk in orange zest. 5. Meringue: Beat the egg whites with ¼ tsp cream of tartar till firm peaks, mixing in caster sugar gradually in a few additions. 6. Spoon out 20 tbsp meringue for cocoa batter, leaving the rest for orange batter. Gently but quickly fold in the meringue into the respective egg yolk batter. 7. Transfer the cocoa batter into a piping bag. Pipe thin "wood grains" onto the base of the pan. Spoon the orange batter gently into the spaces between the "wood grains". Cover the "wood grains" gently with more orange batter. When the base is fully covered with orange batter, repeat the above process 3x until batter is 2-cm from the brim. *Try to work quickly to prevent the cocoa batter from becoming "holey" as batter breaks down much faster in the piping bag. 8. Bake the chiffon cake for 15 min at 160°C and then at 150°C for 10 mins and 140°C for 30-31 min, or until skewer comes out clean. *This is just a guide as each oven’s internal heat is different, do optimize for your own oven. 9. Invert the chiffon cake once removed from oven. 10. Unmould the chiffon cake by hand after cake is completely cool (watch Video tutorial 'Hand Unmoulding Chiffon Cakes for a Clean Finishing'). Gently pull the cake from the sides of the tin at each angle and push the removable base up to unmould the sides. To unmould the cake from the base, gently lift up the cake from the base using hands, repeating this at each angle before turning the base over. Sushi rolls: I have previously shared the recipe for making the sushi roll chiffon cake pops here. The only difference is that I used more charcoal powder to get a darker shade for the charcoal/pandan chiffon sheet cake used to roll around the “rice” from vanilla chiffon cake. Salmon sushi: The salmon is from patterned orange-vanilla chiffon sheet cake (vanilla for thin lines, orange in between). I used PME red to darken the shade of orange chiffon batter to get reddish colour. 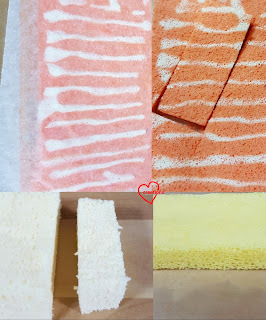 I cut blocks from vanilla chiffon cake for the rice. Top two and bottom left picture in collage below. 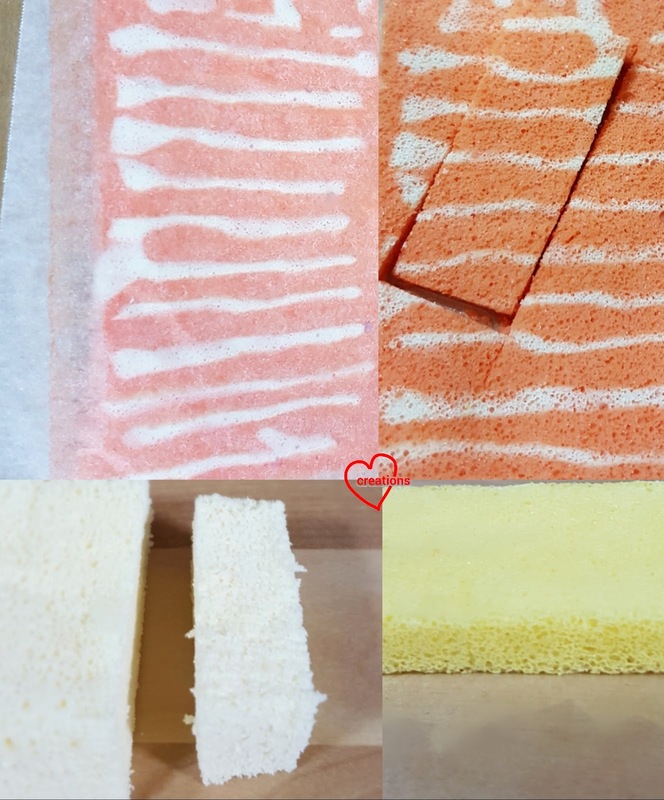 Tamago: Cut rectangles from yellow vanilla sheet cake (vanilla with added natural yellow food colour). Bottom right in collage above. 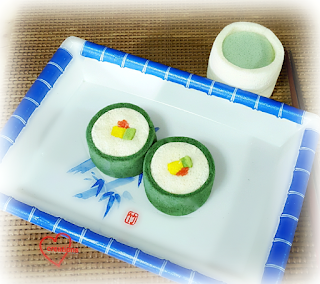 Prawn sushi: I baked the same orange-vanilla chiffon cake as "salmon" in 5-cm cake pop molds and sliced into strips. Roe: That was the challenging one. I cut many small ‘balls’ using a straw from leftover “salmon” batter and stuck them together =). Hope you will like this cute creation too! I will upload a video of the cake onto my Instagram soon. Sorry I missed posting last week as I was busy with family. 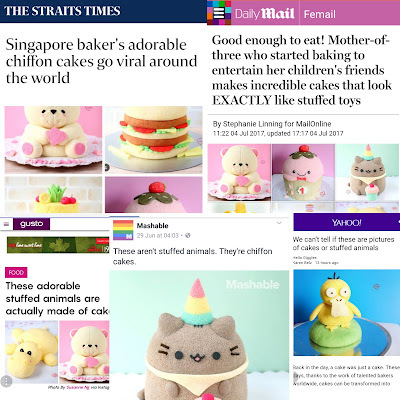 On a side note, I’m really thankful to have my Deco Chiffon Cakes featured in media websites all over the world from Straits Times to Daily Mail Online from UK, Mashable from US and even in other languages like in China, Japan, Portugese and Italy! It’s been an amazing journey. Thank you for being with me!! Article links here. Straits Times video here. Had dropped you an email to lovingcreations33@gmail.com 5days ago but not sure if you have received it? Am inquiring for the cost of chiffon cake for 3 birthday events. Hope to hear from you soon. Thank you Agnes, must have missed out. Can you email to suslovingcreations@gmail.com in future? Will check on that. Sorry and thank you! If you need online cake and flower delivery in Gurgaon, noida or delhi. you can call us at +918822883838.